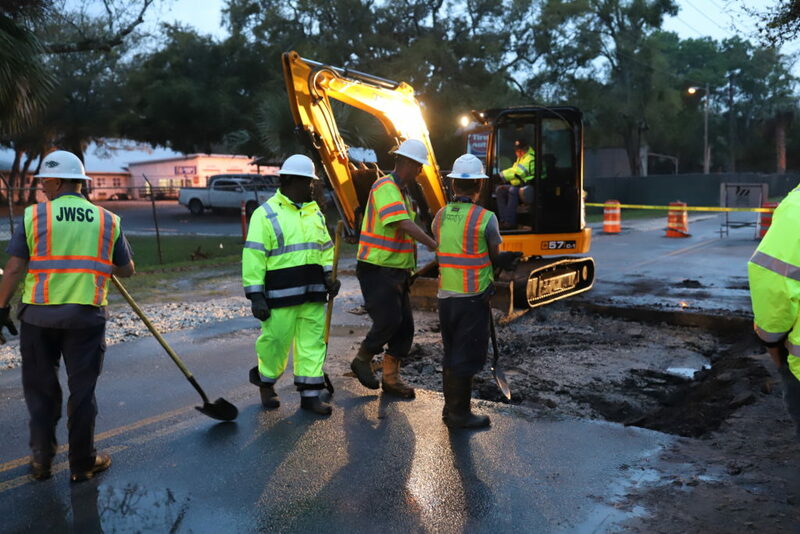 As of Saturday, April 20, our staff has determined that the repair will be extensive enough to justify keeping the 4100 block of Whitlock Street closed in the vicinity of the worksite until the repair process can be completed. Homeowner access is being maintained but all other traffic should be prepared to take another route. 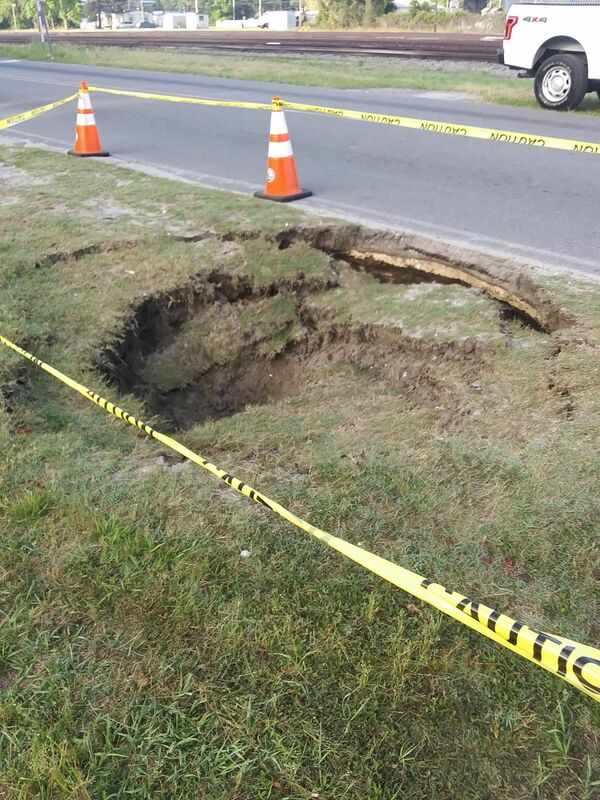 The gravity main buried around 20 feet along Whitlock is made up of reinforced concrete pipe that has deteriorated over decades of use and become brittle in some sections, exposing the re-bar. A 540 foot section of this pipe, manhole-to-manhole, is being bypassed to allow services to continue uninterrupted. 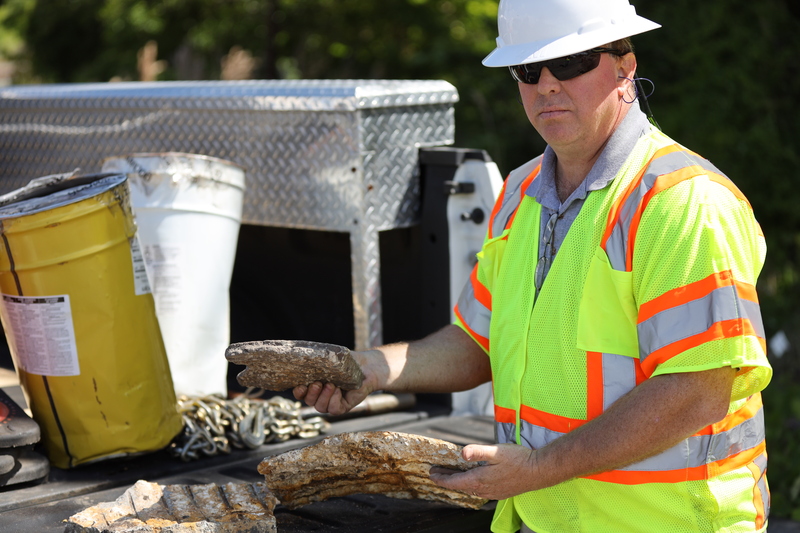 Later this week, CIPP (Cured In Place Pipe) technology materials will arrive that will allow the JWSC to repair the deteriorated pipe with a liner that will cure and harden to the point where a suitable long-term solution can be obtained short of excavating the street. A helpful video describing this process can be seen here. 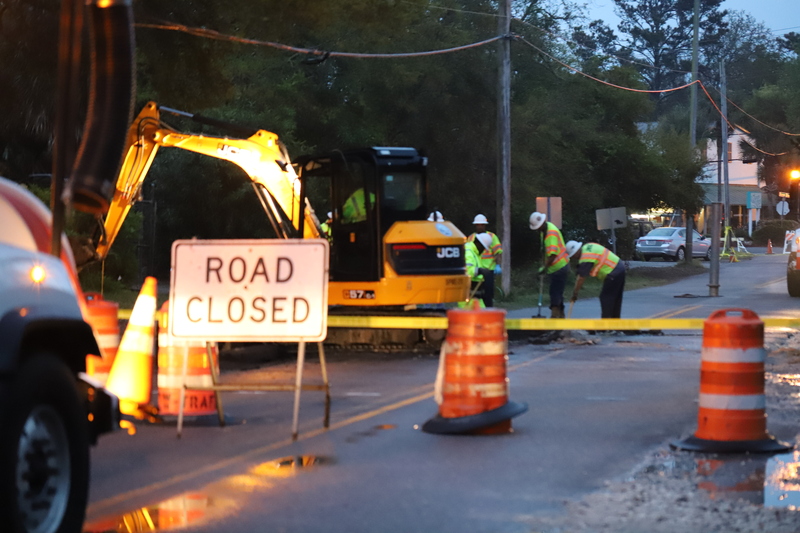 Until this lining has been installed, Whitlock will continue to remain closed to thru-traffic. Optimistically, the repairs could be completed by the end of this week. This entry was posted in Road Closure on April 22, 2019 by Jay Sellers. Due to a tornado warning issued by the National Weather Service at or about 12:15, the BGJWSC has ceased regular operations and closed offices until approximately 1:00 PM on Friday, April 19, 2019. Emergency operations staff may be unavailable to respond immediately during this time. 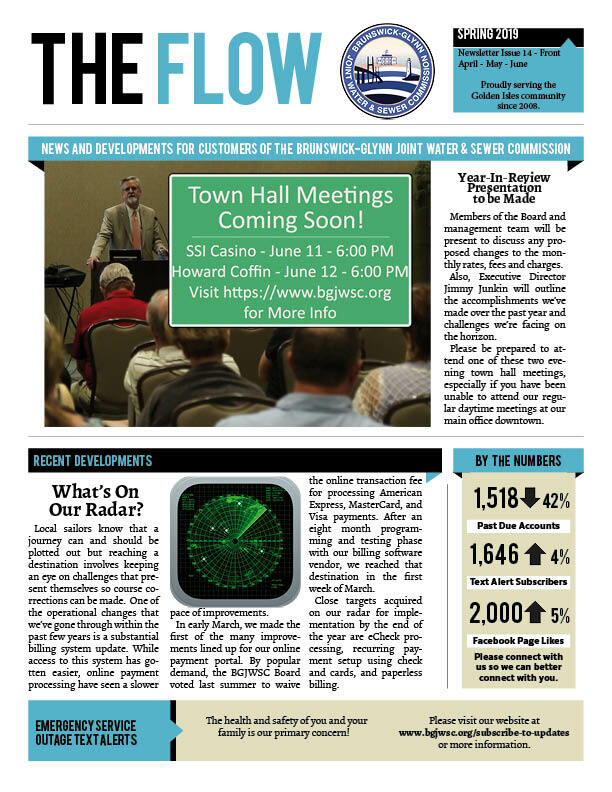 This entry was posted in General News on April 19, 2019 by Jay Sellers. 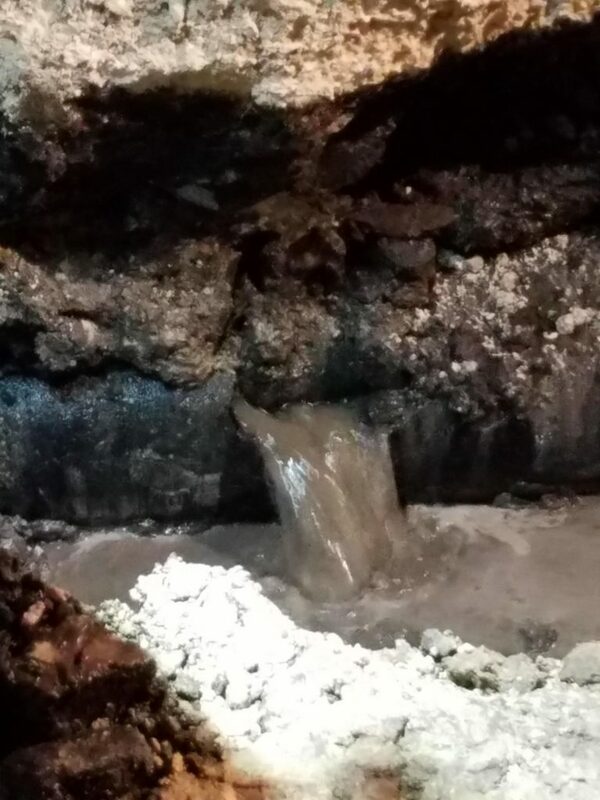 In order to perform emergency repairs to a collapsed 30″ gravity sewer main in the 4100 block, Whitlock Street will be closed to thru traffic north of the Southern Road intersection. Homeowner access will be maintained but all other traffic should be prepared to take another route. At this time, no service outage is anticipated. This entry was posted in Road Closure on April 18, 2019 by Jay Sellers. UPDATE AS OF 11:54 AM: The responding staff are operating in Frederica Road, partially blocking the north-bound lane. Please expect delays and take another route, if possible. The St. Simons Island water system lost pressure in the area serving sections of Sea Palms and adjacent connections, including the shopping center at 3600 Frederica, Shore Rush Drive, Shore Rush Circle, Driftwood Place, Peninsula Drive, South Windward Drive, Bay Berry Circle, Colonial Drive, and Great Oak Place on Friday, April 12, 2019 due to materials failure in an 8″ Transite water main. BGJWSC staff is onsite now restoring service. Once service has been restored, BGJWSC lab personnel will collect water samples for testing. This testing, which takes between 18 and 24 hours, should be completed the afternoon of Saturday, April 13, at which time an all-clear message will be posted. This entry was posted in Boil Water Advisory on April 12, 2019 by Jay Sellers. 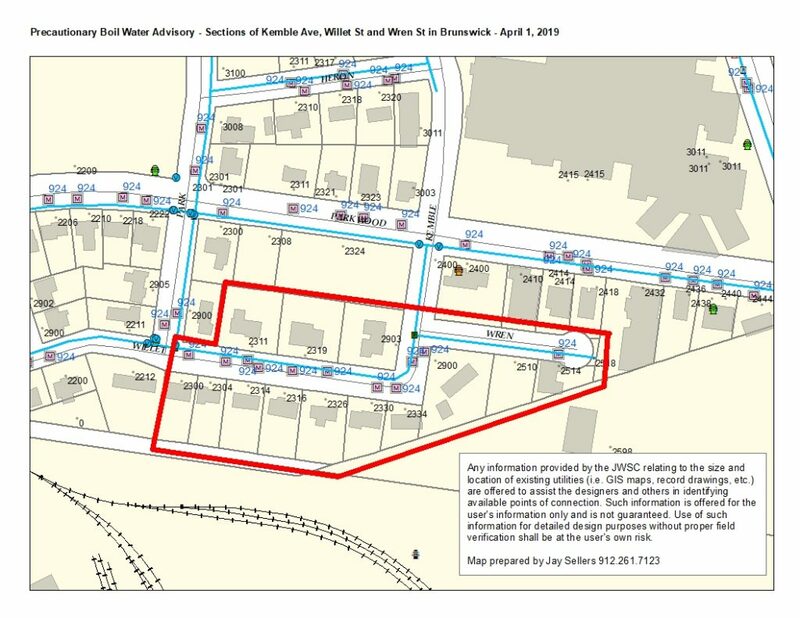 The Brunswick water system lost pressure in the area serving the 2900 block of Kemble Ave, the 2300 block of Willet Street and Wren St on Monday, April 1, 2019 due to the materials failure of a 2″ PVC water main connection. BGJWSC staff is onsite now restoring service. Once service has been restored, BGJWSC lab personnel will collect water samples for testing. This testing, which takes between 18 and 24 hours, should be completed the afternoon of Tuesday, April 2, at which time an all-clear message will be posted. 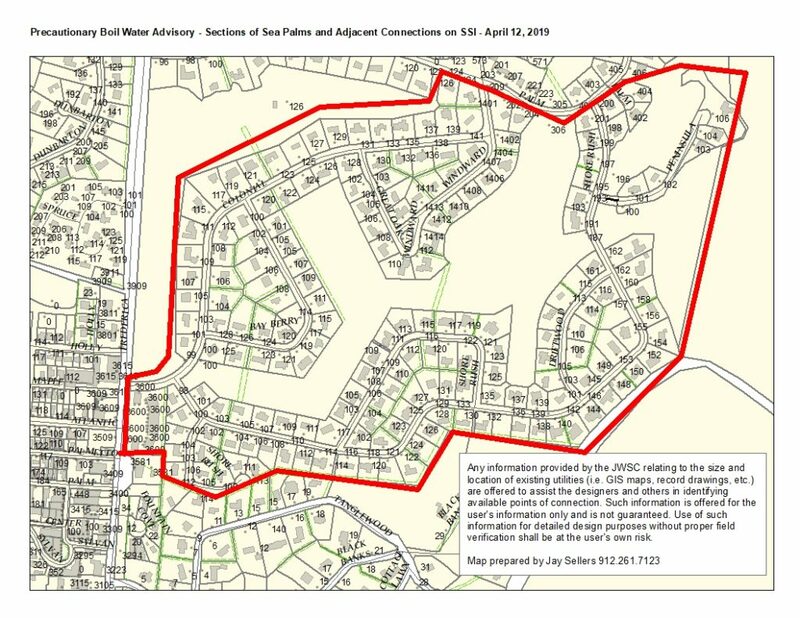 This entry was posted in Boil Water Advisory on April 1, 2019 by Jay Sellers. 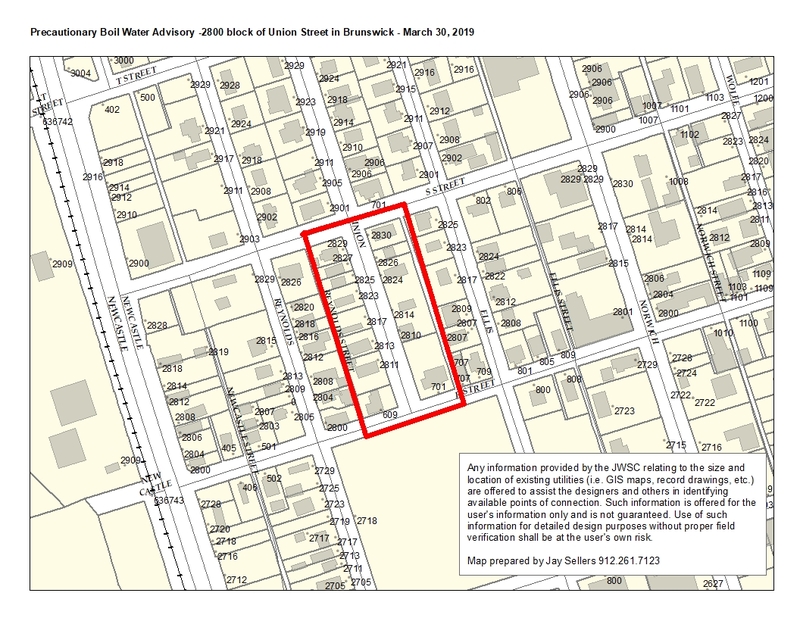 Effective immediately, as of 3:51 PM on Sunday, March 31, 2019, all required microbiological testing of water samples from the area affected by the boil water advisory issued for the 2800 block of Union Street on Saturday, March 30, 2019 has passed. Results have been verified by our state-licensed technician within a certified laboratory environment. 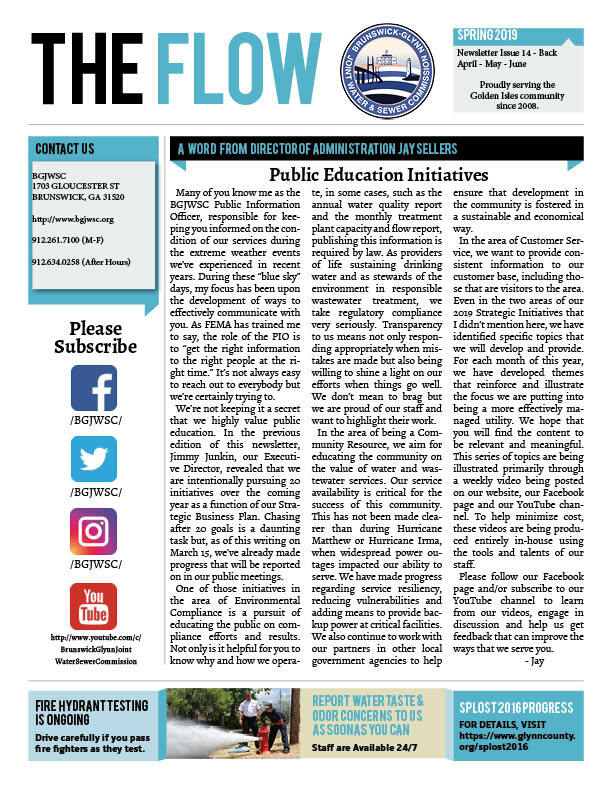 This entry was posted in Boil Water Advisory on March 31, 2019 by Jay Sellers.